On July 11-12, META Center PIs Karen Guillemin, Brendan Bohannan, Bill Cresko, and Raghuveer Parthasarathy participated in the National Centers for Systems Biology Annual Meeting on the NIH campus in Bethesda, MD. 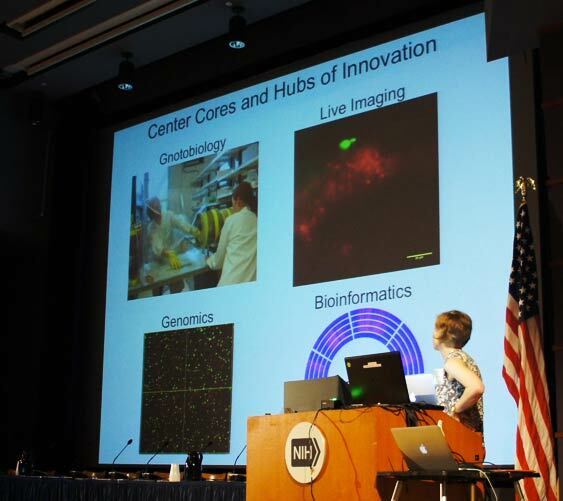 The meeting, attended by representatives of all fifteen of the National Centers for Systems Biology, marked the tenth anniversary of the National Centers for Systems Biology program, funded by the National Institute of General Medical Sciences. We were struck by the diversity of center organizations and the breadth of science covered across the centers. The META Center stands out as the one center devoted to microbial studies, but there were many exciting areas of overlap with other centers, that will lend themselves to future synergistic interactions. These include investigations into innate immune signaling networks at the San Diego Center for Systems Biology and new RNA-based tools for visualizing cellular metabolisms developed at the UC Berkeley Center for RNA Systems Biology.